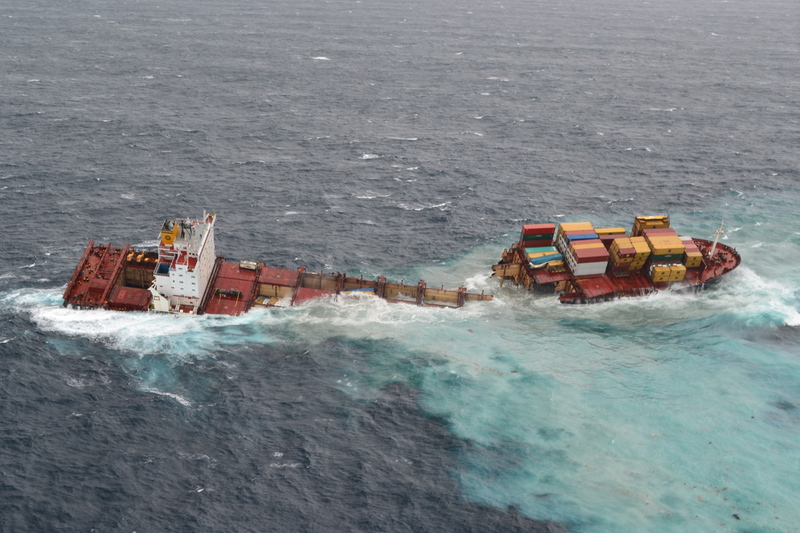 Severe weather overnight has separated the MV Rena into two pieces, which are now about 20-30m apart on the Astrolabe Reef, Maritime New Zealand says. 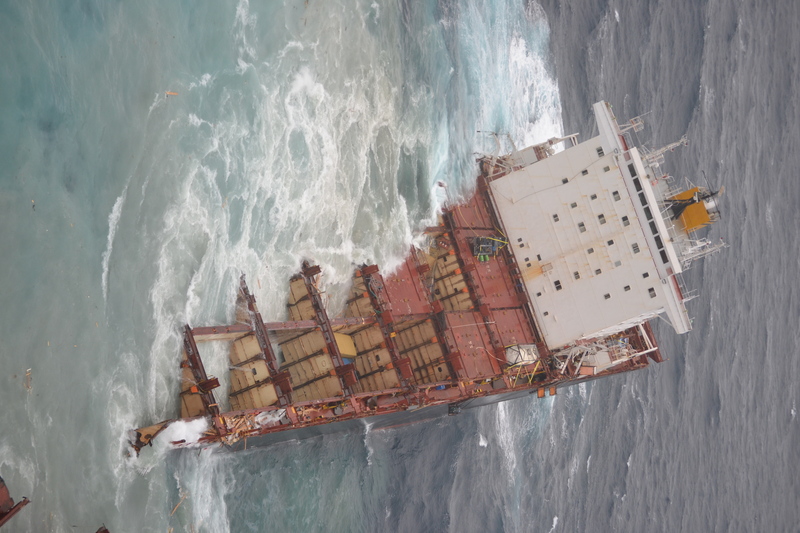 Both sections of the vessel still remain on the reef, with the forward section remaining firmly wedged, while the aft section has separated and moved clockwise (or to starboard) about 13 degrees, after the ship was hit by seas of over 7m overnight, further worsening the damage it sustained following its grounding on the reef just over three months ago. The current bad weather is forecast to slowly ease over next 3 – 4 days. 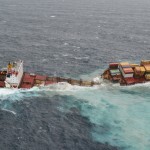 MNZ Salvage Unit Manager David Billington said the fresh damage to the ship had resulted in the loss of a large number of containers and debris. Mr Billington said the vessel Go Canopus was currently connected to the aft section of the Rena and was continuing to monitor its status. 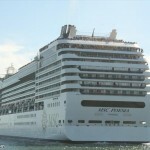 At least 23 containers had been confirmed as being lost from the ship, which were floating or partly submerged, with another 7 (unconfirmed) thought to be in the water. However, Mr Billington said more were likely to be lost. 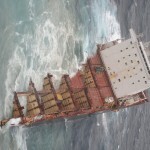 There was also a large debris trail, including wood, around the vessel. 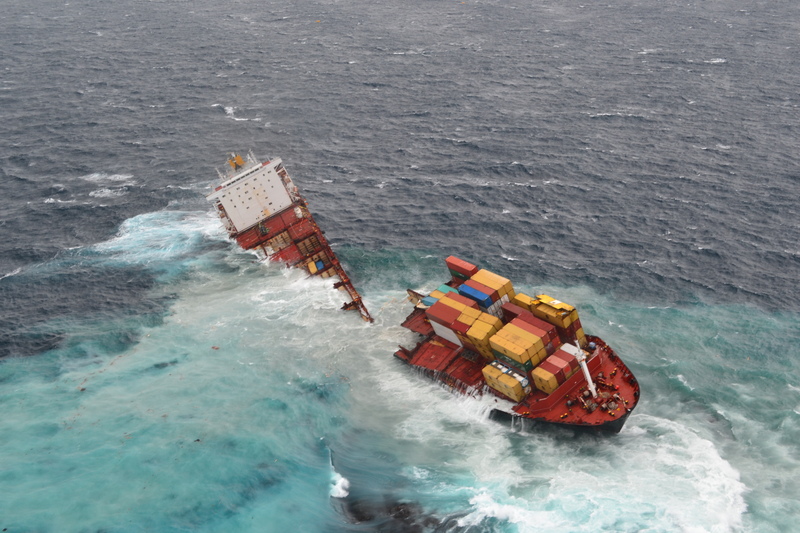 Container recovery company Bramear Howells had tugs en route to tag containers with buoys as it was currently too rough to tow or safely recover them, while vessels with trawl nets would also be sent out to collect debris once weather conditions improved. Navigational warnings had also been issued to shipping, with the port company communicating with individual ships via port radio and warnings issued to recreational vessels via Coastguard radio. 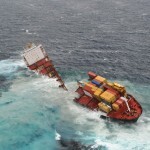 Shipping lanes were also being monitored for containers and debris. The Bay of Plenty Regional Council Harbour Master is considering extending the 3nm exclusion zone due to the large debris field from Rena. 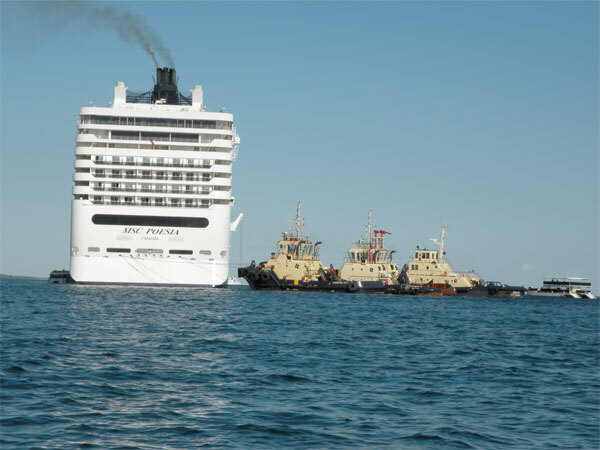 National On Scene Commander Alex van Wijngaarden said the National Response Team had been mobilised, which included trained oil spill response and wildlife experts, who were preparing for the likelihood of more oil coming ashore. “While reports at this stage indicate there has not been a significant release of oil, with the Rena in its current fragile state, a further release is likely. While it is unknown at this stage exactly how much oil may be released, teams have been mobilised and will be ready to respond to anything that may come ashore. The wildlife response had also been increased to help deal with any affected wildlife. “At this stage, preliminary trajectory modelling predicts that any oil released will come ashore around midnight tonight, landing on beaches south east of Mt Maunganui – however, this could change at any time depending on the weather and wind conditions. We also remind people that there may be large amounts of debris or containers that could come ashore so they need to exercise common sense and please keep clear. 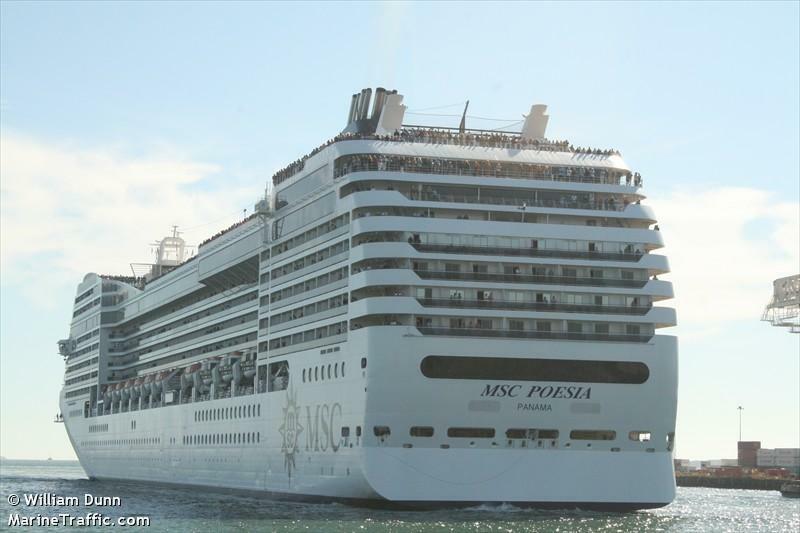 The 294 meter long passenger ship MSC Poesia went aground off Freeport, Bahamas. 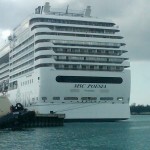 The Poesia was making a scheduled stop at Port Lucaya when it grounded just outside the port. 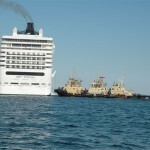 The cruise ship remained aground until the next high tide when four tugs assisted in refloating the vessel. No reports of injuries, damage or pollution being released. 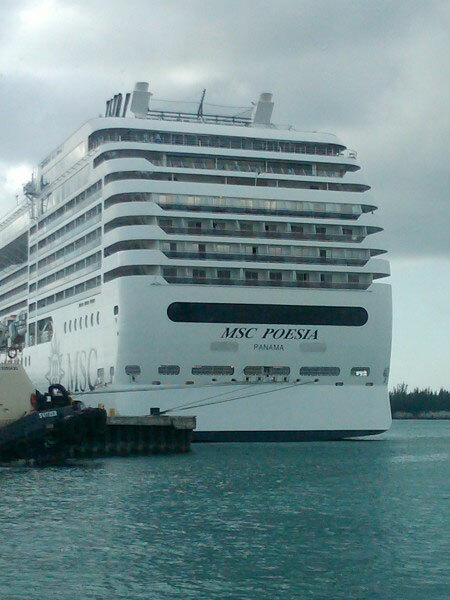 The MSC Poesia proceeded on to its next stop at Little Salvador.